This secluded beachfront oasis is nestled within the Ko Olina Resort, a lush 642-acre gated community where seven crystal clear lagoons shimmer. Offering your choice of deluxe guestrooms or one-, two-, or three-bedroom villas, this Oahu resort offers the ideal accommodations. 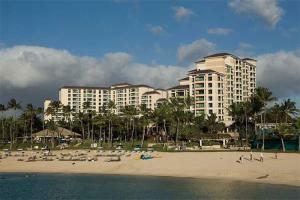 Spacious villas at the Marriott's Ko Olina Beach Club include fully equipped kitchens.